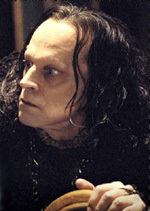 Brad Dourif plays Grima Wormtongue, King Theoden's untrustworthy counselor. Bradford Claude Dourif, a man best known for his weird, eccentric roles, was born March 18, 1850 in Huntington, West Virginia. His father, owner of a dye factory, died when Brad was only 3. His mother remarried Bill Campbell and together they raised Brad and his 3 sisters and 2 brothers. Later, when Brad was in his teens, he was able to go after his interests of art and acting when he attended Aiken Preparatory School in Aiken, South Carolina for a couple of years. He eventually made up his mind to wholly pursue acting after toying with the idea of becoming an artist. Brad started his career in school productions eventually moving up to community theater and ending up in the Huntington Community Players, while attending Marshall University of Huntington At 19 he decided to leave all he knew behind and head off to New York City, quitting his community college. While in NYC he was able to find a job with the Circle Repertory Company where he stayed on for 3 years under the coaching of Sanford Meisner. Brad appeared in quite a few plays during the early 1970’s including ‘When You Comin’ Back, Red Rider?’, where he was spotted by director Milos Forman who decided to cast him in One Flew Over the Cuckoo’s Nest (1975). Even though this film earned Brad national and international recognition, it was not his debut film as so many people note it to be. Yet, it would still be right to say that his portrayal of Billy Bibbit was his big break by far. That role earned him an Oscar nomination for Best Supporting Actor. Not wanting the instant fame, Brad returned to NYC to teach acting and directing at Columbia University until 1988. He then made a final move to California. Brad was unable to avert typecasting after his role in Cuckoo’s Nest. It has often landed him roles as strange, demented characters which he was able to pull off fantastically because of the passion he shows for the roles. Also notably, he has been in many horror films because of this, perhaps most famously as the voice of Chucky in Child’s Play (1988) and its sequels. Brad has also had a number of television appearances in shows including The X-Files, Babylon 5, and Star Trek Voyager.